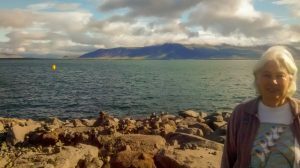 A few years ago, I wrote a blog about the Words by the Water Festival of Words and Ideas. We have continued to visit this lovely festival most years, camping in our little van on the shores of Derwentwater and walking across the hill each day to the Theatre on the Lake, for an enriching series of talks, readings and lectures. 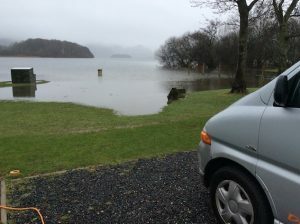 This year, following an unseasonably warm, dry February, the elements decided to greet us in Cumbria with rain, hail, snow and ice, which added a certain interest and spice to our camping. 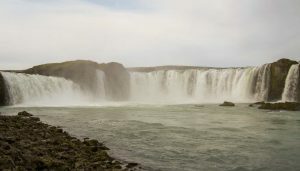 The first night, as we slept, the lake crept up to meet us, so the next morning we were moved to a slightly higher pitch, where we were safe from inundation but could still enjoy the glorious view. The following day, snow crept down the mountains to chill us a little, and the dramas of extreme weather continued through the week. After three nights on the campsite, we arrived back late at night to find our little van all alone. 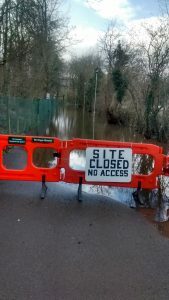 All the other camper vans and caravans had been evacuated during the evening because of the imminent risk of flooding, but as we had been watching the film of Oscar Wilde, with our mobile ‘phones turned off, we hadn’t received the message asking us to head for dry land. We drove out and found a quiet spot beside the road on higher ground, where we enjoyed a peaceful night’s sleep. The next day we booked into a b&b for the rest of the week, which was just as well as the campsite had still not re-opened by the time we left. By then, not only was the campsite underwater, but most of the surrounding fields and woodland. This year’s programme of events at the festival looked as promising as ever, and we had ‘phoned the theatre on the day booking opened, to make sure we could get tickets to all the ones we wanted to attend. Tickets are not cheap, so it is necessary to be a little circumspect when selecting. But between us we covered a fair percentage of the treats on offer. 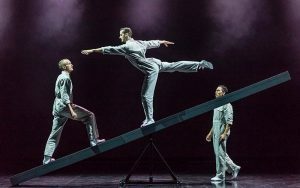 Rather than going through the programme to report on each event, I’ll mention some of the highlights of the festival, and pull together a few threads from the week. Two of the best events we attended were on the first weekend. Mike Berners-Lee gave an informative and balanced talk about climate change based on his new book, ‘There is no Planet B’. The well-researched information in his talk could not fail to shock, but he also found a way to offer at least some hope that all is not yet lost – as long as we all take the threat extremely seriously, and act now to save the planet. Peter Sanford appeared in the main theatre to give a talk entitled ‘Angelology’. Peter is a gifted lecturer and held us spellbound as he explored the history and mythology of belief in angels. He quoted the surprising statistic that one in ten Britons claims to have experienced the presence of an angel. It would appear that many of these people believe in ‘guardian angels’, rather than in the more general, and more interesting idea of angels being messengers from God. 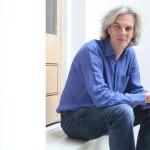 Among the other exceptionally good events were Diarmaid MacCulloch on Thomas Cromwell, Kenneth Baker on Sins and Sinners, Marcus du Sautoy on Artificial Intelligence and Melissa Benn on Education – all inspiring speakers. MacCulloch gently filled some of the gaping holes in my knowledge of history and Baker had fun with the seven deadly sins, amply illustrated by slides. Du Sautoy gave an informative and lucid presentation of where we are in the development of AI and although I heard some of the audience afterwards complaining that he had scared the life out of them, he was honest about the advantages as well as the dangers of AI. Melissa Benn was lucid, charming, ideological and practical as she proposed a better model of education through a National Education Service built on the same model as the NHS. As usual, there were some well-known celebrities in the programme, such as Roger McGough and Melvyn Bragg. As one would expect, both of these spoke or read well, though perhaps being extremely celebrated can make it a little more difficult to stun an audience in a new way. There were also some quirky events, such as Christopher Skaife, the Ravenmaster at the Tower of London, talking about the ravens of the Tower (very good), and Irving Finkel, the Assyriologist at the British Museum, giving a rather strange and histrionic introduction to his latest book. We enjoyed a couple of evening events: first a talk about Oscar Wilde by Michèle Mendelssohn, followed by the film, ‘Wilde’, starring Stephen Fry; and later in the week, a highly entertaining hour with the comedian, Robin Ince. I chaired the Poetry Breakfast, at which 30 poets enjoyed coffee, croissants and fruit juice and read poems, either their own or from well-known poets. Without prior knowledge of the chosen readings, there is a always a certain risk to chairing an event like this, so it was gratifying that as the last reader finished, the clock showed that we had landed fairly and squarely on our advertised end time. There was a philosophy day, at which Raymond Tallis and Julian Baggini spoke; an interesting talk about Gypsy Britain by Damian Le Bas; an inspiring story of a walk round the SW coast path, by Raynor Winn; an exploration of labyrinths and mazes by Henry Eliot; and a fascinating talk about Katherine of Aragon and Juana of Castile, by Julia Fox. At a festival planned many months in advance, there are always likely to be a few changes and cancellations, but we got away fairly lightly this time. I was going to get my husband to report on the events he went to without me, particularly the political ones, but I think I have included enough here to give a good taste of the festival. Unfortunately, we had to leave before the final day, so missed a few events that would have been of interest. This was the first year in which Kay Dunbar and Steve Bristow were not with us for the whole festival. Between them, this ‘Mr and Mrs Ways with Words’ not only started all three festivals (Dartington and Southwold being the others), but have run them brilliantly ever since their inception. 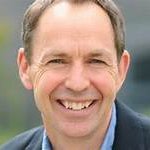 They are now taking a back seat, and have handed on the Directorship to Leah Varnell, who with the rest of the Dartington team, especially Jane Fitzgerald and Philip John, is well-capable of maintaining the high standard of festivals that we have come to expect. 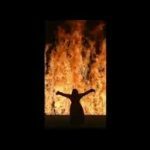 Last summer, Mark Oakley, who was at that stage still Canon Chancellor of St Paul’s Cathedral before his move to Cambridge, invited me to the cathedral to see the two Bill Viola installations/films there. ‘Martyrs: Earth, Air, Fire, Water’, was installed in the cathedral in 2014. Set across four vertical plasma screens, it depicts four individuals being martyred by the four elements. The work is silent and deeply moving. The second video, ‘Mary’, was installed in the cathedral in 2016, and is a celebration of women, using depictions of Everywoman. I found both artworks extremely moving, so jumped at the opportunity to visit the Royal Academy last week for their exhibition, ‘Bill Viola and Michelangelo: Life Death Rebirth’. Despite mixed reviews, the exhibition did not disappoint. 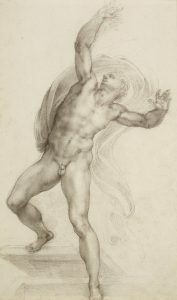 The main exhibits were by Bill Viola, but they were accompanied by a number of small drawings by Michelangelo. Both artists, of course, demonstrate the beauty and power of the human body, particularly the male body. Michelangelo’s specific meditations on the Resurrection become, in Viola’s work, celebrations of both transformation and physical rising. Fire also makes an appearance, but even the fierce flames of that film eventually transmute into water. In another room, there was a triptych of three huge screens side by side. In the first a woman was giving birth, in the third an elderly woman (apparently Viola’s mother) was on her deathbed, and in between there was a floating body, which to me suggested the state of swimming in amnion. Although I have given birth myself, this was the first time I had watched the process from the other end, and it was so mesmeric that no one in the room moved until the child was eventually born. The theme of water is so universally present in these works that it almost appears to be an obsession, but it is clearly a metaphor both for life and also for transcendence. Walking through the semi-darkness, watching the videos, some of which take around a quarter of an hour to play, one is transported into Viola’s world and receives a glimpse of his spiritual awareness. The cleansing of one’s normal attention also made the Michelangelo drawings that much more striking, as one became conscious of the way in which the artist conveys so much of the important essence of the figures with so few strokes of the brush or pen, whether it be a depiction of Christ’s crucifixion, the risen Christ (pictured right) or the tenderness of a nativity scene. Before I went into the exhibition, a couple of men in the café told me that they had got round it in 10 minutes. I was therefore surprised to find myself still in the darkened rooms after an hour an a half; and even more surprised to find that the images, and Bill Viola’s meditation on life and transcendence, travelled with me when I left. I again enjoyed chairing some of the events. As long as one does the homework properly, ie reads the books and thinks about how to introduce the speakers and ask some pertinent questions, this is great fun. I thought I’d tell you a little about two of the events that I chaired, and the Oversteps Day I organise and chair each year. Sean Borodale‘s last collection, ‘Bee Journal’, was sheer joy to someone like me who kept bees for many years. 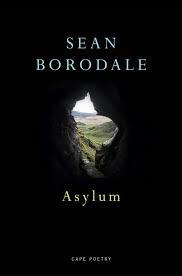 His new book, ‘Asylum’, takes a subject that is likely to be more challenging for anyone with an aversion to being underground. The whole audience was also particularly sensitive to the theme of speleology, as we were meeting on the very day that the divers in Thailand were attempting (successfully, we were relieved to hear) to rescue the boys who had been trapped in a flooded cave for nearly a fortnight. ‘Asylum’ is based on the thirty miles of subterranean caves, mines and quarries of the Mendip Hills. Never would I have imagined that the ground below our feet is full of poetry; but having read ‘Asylum’, I can vouch for the fact that it is. Sean’s poetry is muscular, honest and uncompromising — and I recommend it highly. 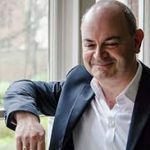 Mark Oakley is Canon Chancellor at St Paul’s Cathedral, though he will be moving at the end of next month, to take up the post of Dean of St John’s College, Cambridge. 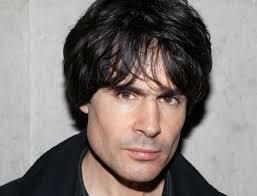 He is also a poetry-lover, with a keen ear and discriminating mind. 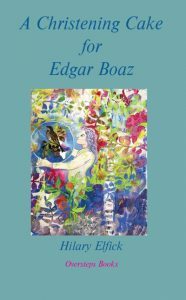 In his recent book, ‘The Splash of Words: Believing in Poetry’, he has selected and presented twenty-nine poems, from all ages and in all forms, in each case then going on to a wide-ranging discussion of the work, his response to it, and his personal and faith journey. 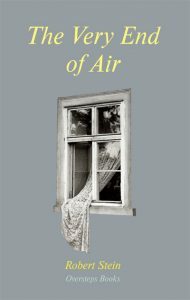 It makes riveting reading, and because practically all the poems are ones I have loved for years, reading it was like meeting up with old friends and forming an even deeper acquaintance with them. The poems Mark chose are certainly not all, in any obvious sense, religious; and some of them would be considered by some people to come into the ‘difficult’ category. But, accompanied by Mark’s wit and wisdom, no one could fail to enjoy and be inspired by this anthology and the essays following the poems. This was borne out by the fact that there was a long queue at the signing tent after the talk; and I reckon that practically everyone who attended the event was moved to go straight to Waterstones to buy Mark’s book and get him to sign it. Because of the stunning weather all week, it looked as though some of the audience numbers were slightly down this year, probably because of the temptation of sandy beaches and cooling sea not very far away. That was not the case, however, with the Oversteps Day, at which we had larger audiences than ever, and as the room filled up for the first session, we had to go out in search of extra chairs to accommodate everyone. In the two morning sessions, ‘A Warm Welcome’ and ‘Too Good to Lose’, I introduced the poets whose books had been published by Oversteps this past year, including some who had also published with us before. Included in these morning readings were Paul Surman, Ian Royce Chamberlain, Melanie Brandon, Rebecca Bilkau (pictured reading above), Hilary Elfick, Sue Proffitt and Jane Spiro. 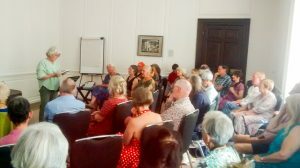 Then in the afternoon we had two themed events: ‘Once upon a time’ and ‘Where on earth?’, at which the morning readers were joined by Jennie Osborne, Christopher North, Susan Taylor, Simon Williams and myself. The audiences were enthusiastic about the day, several claiming that, although the Oversteps Day is always enjoyable and inspiring, this was the best one yet. I am therefore truly grateful to all the poets who read so well, to the audiences for their appreciation and applause, and to the staff at Ways with Words for granting us this wonderful platform each year, on which to share some of the best of contemporary poetry. Now I’m looking forward to Ways by the Water, the sister festival that takes place in the Lake District in March each year. In 2007, Anne Born, the Managing Editor of Oversteps Books, invited me to submit a manuscript for publication, which she promptly accepted. 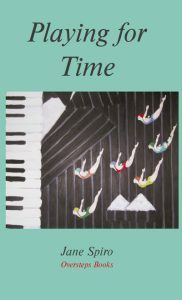 She wanted to have the book published in time for Ways with Words at Dartington that July, so moved the book through the production process quite quickly, and ‘Touching Earth’ came out in good time for the festival. 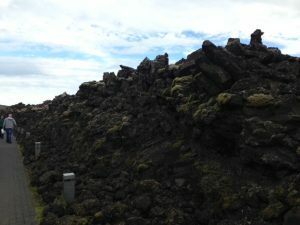 The collection included various sections including science and ecology, and the experience of being a woman. Later, Anne commissioned me to put together a collection of my winter and Christmas poems, but this book, ‘Festo’ was not published until after her death. 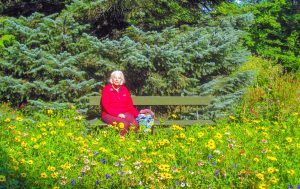 The following year, Anne became ill and I went to visit her. ‘Anything I can do to help, Anne’ I enquired, thinking she might like me to take some parcels to the post office. ‘Yes’, she replied. ‘I want you to take over Oversteps’. I must admit that running a publishing house was not something on my wish-list, and I wriggled for over an hour before I accepted her ‘kind offer’. 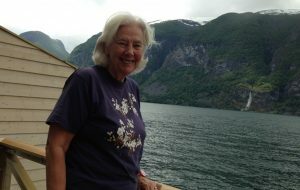 I was already busy with my own writing, as well as a full programme of guest lecturing and readings, and I was also working as an environmental consultant; but Anne was nothing if not determined and persistent, so before I left her house that afternoon, I had agreed to become Managing Editor. There then followed a steep learning curve. 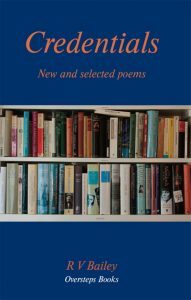 Ten years on, I am pleased that I have had the opportunity to publish books by so many good poets. The logo on the left is the original one, which shows the back steps up to Anne’s lovely house in South Devon. To balance this , I designed a new, more modern one, and I have used both ever since (see right). 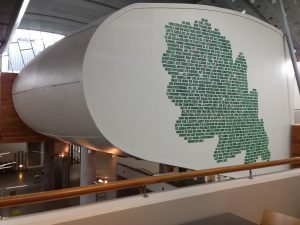 My first ‘discovery’ was made that spring, when I looked up a poem of mine in the Irish magazine The SHOp while visiting the Scottish Poetry Library. There I found work by a poet called Miriam Darlington, to which I responded enthusiastically. 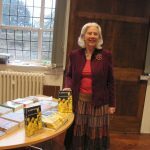 I traced Miriam to Devon (where Oversteps is based), and that July, her book, ‘Windfall’ was published, once again in time for a reading at Ways with Words. We were in business. 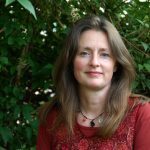 Miriam has since then undertaken a PhD in Creative Writing, and is now a regular contributor to the Sunday Times with her nature writing. In the last ten years, I have published something in the region of 90 books, and Oversteps Books has taken up a great deal of my waking hours, though I’m pleased to report that it has not stopped my own writing. 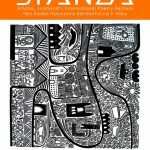 I will write in my next blog about the many opportunities poets now have for being published; but for this one, I’ll share some information about getting published by Oversteps. To start with I published twelve books a year; as the work grew and Oversteps became better known, I found it necessary to reduce this to ten books per year; and I am now endeavouring to limit the production to eight books per year. Our books are well-reviewed and Oversteps poets give readings at many of the major festivals and poetry venues. How does one go about having a book published by Oversteps? Full details are on the Oversteps website (www.overstepsbooks.com), but here are a few markers. First, we publish only poetry, and accept submissions only from poets who have had a decent number of poems published in respected poetry journals or have won major competitions. This is just to keep the submissions to a manageable number; but even so, I sometimes receive as many as 300 submissions in a year. From those submissions, I select between two dozen and thirty of the best poets, who are then invited to submit whole collections; and these are put before the Editorial Board at one of the two meetings we hold each year. 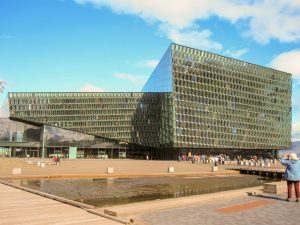 No one knows who the members of this committee are — in order to avoid any arm-twisting; and the members of the board have no idea whose collections they are considering, as they are presented with the submissions ‘blind’. They have several weeks to work on the manuscripts before the meetings, and we then meet for several hours to thrash out which few books we can take forward to publication. Because of the ‘blind’ system, it really is the case that the poetry is judged on its own merits, and I happen to know that some quite well-known poets have not managed to squeeze through on occasions. I often wish I could take on more of the poets, as most of the collections that get this far in the process are certainly worthy of publication; but I simply cannot take on more books than I do at present. I then contact the successful poets with the good news, and prepare memoranda of agreement for them to sign. At the same time, I have the unpleasant task of turning down those who did not make it. I hate having to do this, and am grateful that most poets respond graciously to this bad news; but there have been a handful whose responses have been less than pleasant. A few of the poets who were very close to being accepted have been offered the possibility of re-submiting later, and some of these have been successful. I use desk-top publishing software to work on the manuscripts, and negotiate closely with the poets all through the process. I am a very fussy editor, and I’m glad to say that we have managed to avoid any typos or other mistakes in the finished books, largely because the manuscripts go back and forth between me and the poet many many times before I’m satisfied. The poets generally like to provide their own artwork for their covers, and one of the tasks I most enjoy is designing those covers. The books are produced to extremely high standards in terms of both editing and design, and we receive many very favourable reviews. With the first book (Windfall) I developed a house style that would allow a huge range of variations, while still remaining recognisably Oversteps. Once I’ve checked the final proof and ordered the books from our extremely helpful printer, I can start on the post-publication work, which includes adding the new book to our website and sending out a newsletter about it. I register the new book with Nielsens, send copies to the six deposit libraries and the Poetry Library, inform organisations such as the Poetry Society, decide which magazines I should send review copies to and send those off in the hope that we might get reviews, pay the printer and sell as many copies as I can to recoup some of the costs. Poets are expected to help with the marketing and to arrange some readings, but I also organise some high-profile events at which they can read their work. As you will have gathered from my description of the submissions process, the chances of being accepted by Oversteps are not high. But for the fortunate few who do manage to squeeze through the net, they will not only have a published book to be proud of, but will also be part of a successful and supportive group of poets. When I took over as Managing Editor, I managed to secure a couple of grants from the Arts Council, which allowed me to purchase some necessary equipment and software. I have never applied for funding since then, as I was aware that other endeavours that were dependent on external funding often found that they could not survive when that funding was withdrawn. I therefore tried to make Oversteps self-financing. This was, of course, only possible as long as it was not necessary to provide salaries. I’m pleased to say that we have managed to survive on this basis through the difficult economic conditions of the last ten years. But I have to admit that it is getting more difficult, and there are questions as to how much longer we can stay afloat. There is a constant stream of book orders, most of which come through our website, and our wonderful poets help by giving readings and selling books themselves; and a small handful of our poets have returned again and again for reprints, pushing their sales figures up into the thousands. I am deeply grateful to them. I am also grateful for the unexpected skills I have had to acquire. It has sometimes been challenging having to struggle with new technology, but most of it has been fun. I have also made a huge number of new friends, many of whom have become important parts of my life. I am always surprised when I first hear a new poet reading from their Oversteps book at a public event. Having been close to the work for many months, it suddenly comes alive in a new and exciting way. We have been fortunate to be given reading gigs at festivals and other events all over the country; but our special thanks must go to Ways with Words in Dartington, Devon, who give us a whole day every year — the festival’s Oversteps Day — to present the work of Oversteps poets. This year the Oversteps Day will be on July 14th, and I hope to see many of you there. Before that, there is a group reading at the Poetry Café in London, on Thursday 7th June. And there are many other opportunities to hear our poets reading. I include some of the forthcoming readings, as well as news about competition successes, in the Oversteps newsletter <overstepsbooks.wordpress.com>. After ten successful years, questions are bound to arise about the future. 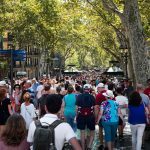 The more Oversteps grows and prospers, and the number of poets continues to multiply, the harder it is for one person to manage the whole business; but this blog is just to celebrate the first ten years. The future will unfold in its own sweet time. In the meantime, I’d like to send warm thanks to all who have made Oversteps so successful: the poets (particularly the poets! ), those who have bought books from us, those who have given us readings and other gigs, those who have responded to my newsletters — and to my long-suffering husband. An invitation to read my poetry to an international conference in Bergen inspired me to book a few extra days in order to explore a little more widely. We therefore left home at 5.00am on a warm bright summer’s morning, to take a train through the rolling hills and woodlands of Surrey, passing an emerald green field in which three deer were having a leisurely breakfast. In contrast to this peace, Gatwick airport was frenetic: perhaps it wasn’t such a great idea to travel on a Saturday in June. Leaving behind the English heatwave, we arrived in Bergen, reputedly the wettest city in Europe. We didn’t experience any torrential downpours, but became fairly resigned to persistent, though not constant, drizzle. However, Bergen is beautiful, and (armed with umbrellas) we enjoyed exploring the city and meeting the huge marching bands that frequently take over the roads. 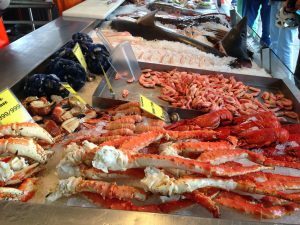 The Hanseatic buildings, in particular, are attractive and well-preserved; and the fish market down by the harbour is enough to make anyone’s mouth water. We had booked a three-day tour with Norway on a Nutshell, so the next day we made another early start to take a train up over the mountain to Myrdal, on the snow-line. There we caught the famous Flåm Railway down the steep valley to the little town of Flåm in the far upper reaches of Sognefjorde, the longest and deepest fjord in the world. 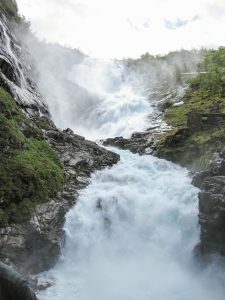 On the way down, the train stopped beside the Kjosfossen waterfall, so that we could all get out to enjoy the majestic spectacle. 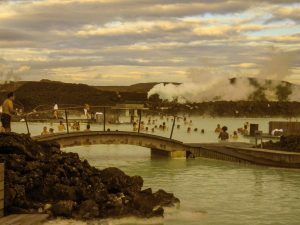 Tourists are treated to the sounds of a siren nymph singing to attract them to destruction, and a red-clad dancer also appeared on a rock above the waterfall, to entice any unwary travellers. 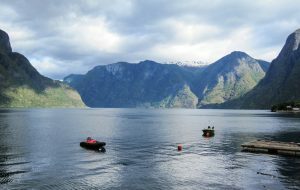 At Flåm we raced for a ferry that took us to our hotel at Aurland, a delightful village a couple of miles downstream. Here we had a fantastic room in a cabin that protruded right out over the fjord. We took our lunches outside a bakery, where they served excellent organic food. 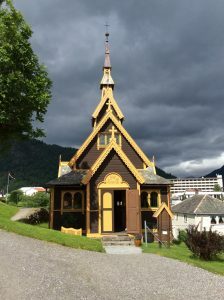 The next evening we took another ferry on to Balestrand, where our hotel was immediately behind the charming Church of St Olav, built by an English woman in the 19th century. The following morning we climbed up the mountain to explore some of the nature trails through the forest, and in the evening took the high speed ferry back to Bergen, which involved travelling at 33 knots (almost 40 mph) for nearly four hours. The conference started the next morning, and over the next three days I was surrounded by fascinating scholars from all over the world, all of whom were researching and publishing on the writings of mediaeval women. Some of the mediaeval women were familiar to me, indeed formed the subjects of my poems, but some of the presentations introduced me to characters and manuscripts that I had never come across before. The afternoon before the conference, we were given a tour of mediaeval Bergen, by a professor from Bergen University, which set the scene for the following days of lectures and presentations. 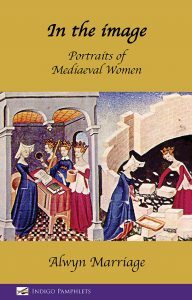 Professor Diane Watt is the power behind this particular Leverhulme-funded project; and she had very generously given me an hour in middle of the conference, to read from my recent publication, In the Image: Portraits of Mediaeval Women. I sold quite a number of books, which meant that my luggage was considerably lighter for the homeward flight. 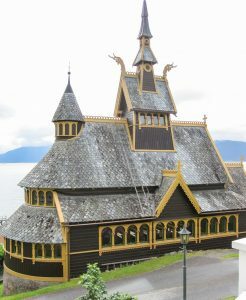 The conference was held at the University of Bergen, and all the major sessions, including mine, were held in what is called the EGG. Strung across the open space within the building, it does not appear particularly large, but is in fact a huge raked lecture theatre. On the final evening of the conference we attended an excellent banquet in the Schợtstuene, the Hanseatic Assembly Rooms in the Bryggen. 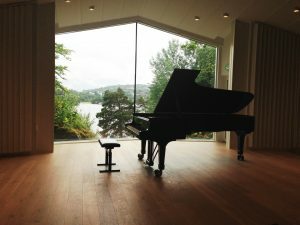 Then on the remaining two days of our visit to the city, we went to the University Museum, the Maritime Museum, and took an enjoyable tour out to Edward Grieg’s house at Troldhaugen, where we enjoyed a dramatic recital by the pianist Espen Aspaas, looking out at the view that Grieg would have enjoyed as he wrote. During March, I was fortunate to be able to attend three different festivals in the north of Britain, which were all very different. First, I went to stay with a school friend in Cupar, so that we could go together to some of the events at the Stanza Poetry Festival in St Andrews, on the breezy east coast of Fife, in Scotland. The workshops were sold out before the public had much chance to book, but the presentations I attended were excellent. Eleanor Livingstone is the inspiration and organiser of this festival, which manages to be both intimate and popular. Of the readings I attended, the three highlights were i) Alice Oswald talking about Homer, ii) her poetry reading in the evening and (iii) the reading by Kathleen Jamie. I had last heard Alice at the finals of the T S Eliot prize at the Festival Hall in London in January, and I never miss an opportunity to hear her mesmerising readings. But the Homer lecture was an unexpected delight, bringing ancient literary gems to life in the 21st century and raising some fascinating questions. 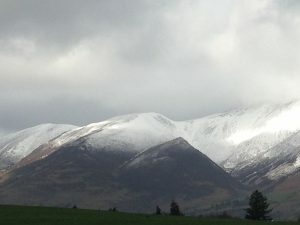 From there I took a train down to the Lake District, in order to spend a few days in Keswick for the Words by the Water Festival. 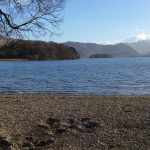 As usual, we camped on the shore of Derwentwater, in order to walk across the hill each day to the Theatre on the Lake; and we were fortunate to enjoy dazzling sunny weather throughout our stay. The picture above is the view from our little camper van, parked all week within a few metres of the sparkling water. Because of other commitments, we had to miss both weekends at this lovely festival, but very much enjoyed the days we were able to stay. The first afternoon, I listened to Helen Mort talking about fell running and poetry, a combination which appears to work well for her; and during the week we were treated to a wide range of subjects, from Bronte and Shakespeare to witches and heart surgery; and I even managed to watch the film of Doctor Zhivago, just a few decades after it came out. For me, the highlights here were i) Elif Shafak, the Turkish novelist, who had us all entranced (and one of whose books I bought, despite all my best intentions not to buy any more books! ), ii) Raymond Tallis, talking about God, free will and the NHS, and most entertainingly of all, Natalie Haynes, the comedian, presenting a show about Greek drama, which contrived to be both informative and hilarious. 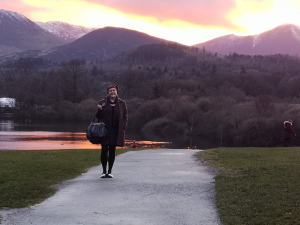 Words by the Water is one of the sister-festivals of Ways with Words in Devon; so as the happy memories of Derwentwater begin to fade, we can begin to look forward to another wonderful festival in July. We left Keswick and headed across the Pennines to York, where I was giving two presentations at the International Women’s Festival at York Explore the next day. The first of these was a poetry reading, in which I concentrated, appropriately, on poems about women – of which I have a large number. 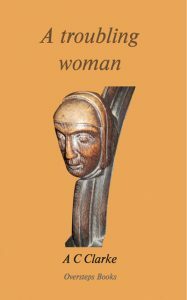 A new collection of my poetry, with the theme of mediaeval women, is due to be published in the next couple of months, but I did not, on this occasion, include any of those. There will be time enough for those particular women when the book comes o ut. 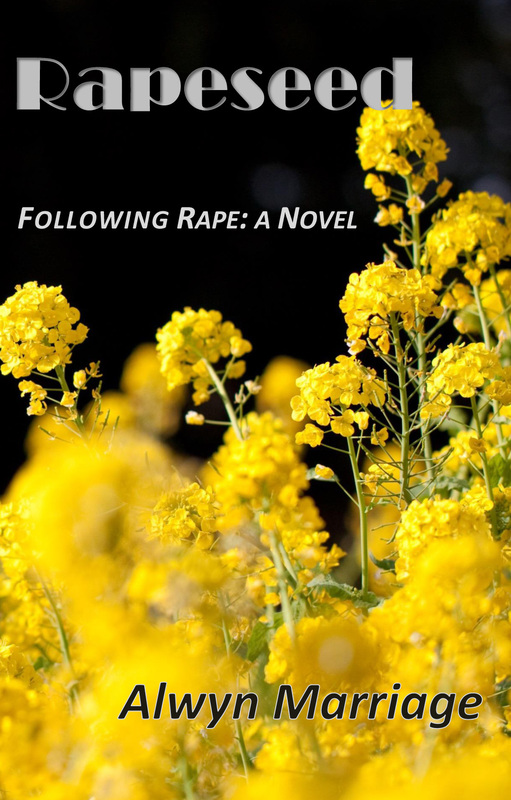 The main reason for being in York was to launch my first novel, ‘Rapeseed’. I have published eight previous books, all either poetry or non-fiction, but fiction is a new departure for me. It was lovely to find a couple of good friends in the audience, and I was pleased to be able to sign a number of copies of the book. A couple of days later I gave a talk and reading from the book to the Southern Counties branch of the Society of Authors, and there are a number of other readings and presentations coming up in the next few months. 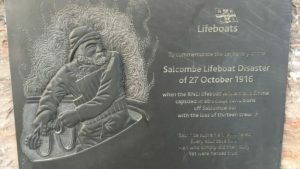 One hundred years ago, early in the morning of 27th October 1916, the Salcombe lifeboat was called out. Fifteen men ran from the town to South Sands to launch the William and Emma into a turbulent sea. The call turned out to be unnecessary as the ship they went to rescue was blown ashore, but vital messages to inform the lifeboat crew of this fact did not get through because some telephone lines were down; and it was many hours later that the lifeboat crew, cold wet and tired, attempted to return to Salcombe in ever-worsening conditions. 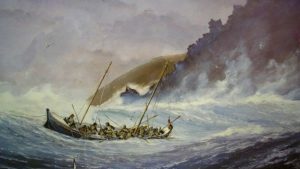 The bar at the entrance to the harbour is a well-known hazard, particularly towards low tide; and battling into a Force 9 gale and ferocious seas, the lifeboat was flipped over by a gigantic wave, with the result that 13 of the 15 men on board perished. 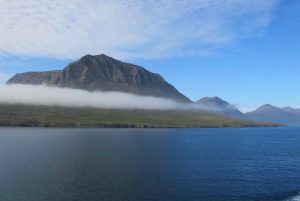 Many of the crew’s families and friends were watching in horror from the cliffs, unable to do anything to avert the catastophe. The men clung onto the upturned hull for as long as they could, but subsequent waves washed them off and out of reach of the boat. The two survivors, Eddie Distin and Bill Johnson, were rescued with ropes from where they were clinging onto rocks a little further along the coast. Five of the bodies of other crew members were found, but the remainder never emerged. Salcombe was used to loss, as this was during the First World War and many young men had already lost their lives; but the scale and immediacy of this disaster plunged the town into deep grief and mourning. In 2016, one hundred years to the day and the hour of the disaster, people from the area turned out in force to commemorate the event. 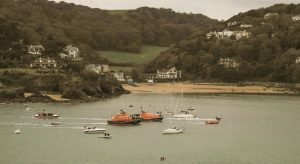 There was a church service in Salcombe, followed by a procession of almost 100 boats of all shapes and sizes, to where the lifeboat perished, in order to ‘lay’ a wreath in the water. The flotilla included three current and three decommissioned lifeboats, as well as pleasure craft and fishing boats. An Air Sea helicopter hovered overhead, and thirteen shots were fired, in respect for the thirteen men who lost their lives. We stood on the clifftop watching the ceremony and casting our minds back a century to men long dead. The day could not have been more different, as the sun was shining brightly and the calm sea glittering with silver and gold. The scene below us was poignant and evocative, and there were signs of tears on some of our faces. Does it make sense to weep for men who died so long ago, and whom we never knew? Yes, I think so. 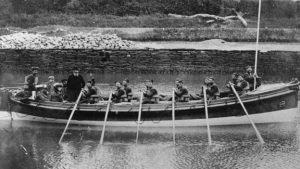 The lifeboat men of today are in a direct line from these courageous men, and they still go out in all conditions to help those in distress. I was at a party in Salcombe a few years ago when a ‘shout’ went up. 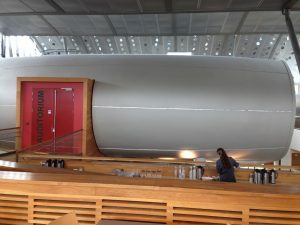 Without a moment’s hesitation, half the men in the room put down their (non-alcoholic) drinks and walked calmly out of the door and down to the lifeboat house. We saw the modern lifeboat leaving the harbour a few minutes later. 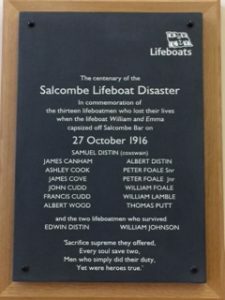 This plaque is in Salcombe parish church, and commemorative stones will soon be laid on the coast path to mark the spot below which the disaster unfolded. 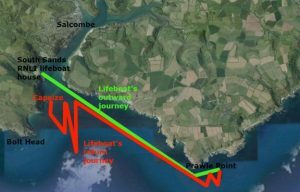 If you would like to learn more about this tragic event, there is a book about it by local historian Roger Barrett who is Curator of Salcombe Lifeboat Museum and former Station Manager at the Prawle Point National Coastwatch Station. The book is published by Salcombe Lifeboats at £7.99. A further plaque in honour of the men was dedicated by the Bishop of Plymouth during the church service this morning. 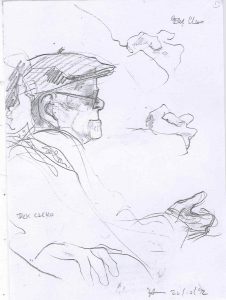 The poet, Jack Clemo, was born 100 years ago this year, into a poor, pious, working class family in the china clay area of Cornwall, which he described as ‘a fitting birthplace for me, being dwarfed under Bloomdale clay-dump, solitary, grim-looking, with no drainage, no water or electricity supply, and no back door.’ He was a bright, precocious child who could, apparently, recite the Lord’s Prayer at 18 months, and was reading fluently by 4. However, a few days before his 5th birthday, his eye troubles began. He became so light-sensitive that he had to spend months in total darkness, with his eyes bandaged. He suffered another bout of blindness when he was 12, and his eyesight deteriorated in the ensuing years, resulting, in 1945, in total blindness. He was, however, developing as a poet. Deaf, blind, angry, poor and religious, Jack had difficulty forming relationships, but became convinced that God intended him to marry. The prospects for future marital happiness were not great, but then, in 1967, he received a letter out of the blue from Ruth Peaty, wanting to get to know him because ‘I think you are an interesting personality’. A strange correspondence began which led, the following summer, to a meeting and, on 26th October 1967, to Jack and Ruth’s marriage. During the following year Jack wrote more poetry than he had ever done before. My own contact with Jack came about for two reasons. First, in the 1980s and 90s I was editing a journal called Christian, in which I always gave space to a wide range of good modern poets. Jack was a great friend of this journal, and over the years I published a fair number of his poems. Then I also included one of his poems when I edited the anthology New Christian Poetry for Collins in 1990. I was also Literature Coordinator at the University of Surrey at this time, where we had an Annual University Poetry Lecture in which one modern poet gave a lecture on another respected modern poet. There was no question of Jack speaking in public, so I invited Donald Davie to give the lecture, and Jack, Ruth and Ruth’s sister, Bella, came to stay with me and attended the lecture. 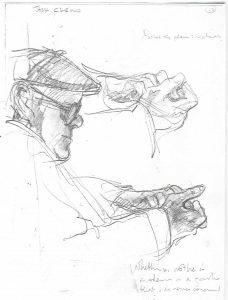 The artist, Heather Spears, was present at the lecture and produced the wonderful drawings of Jack that I’ve included on this blog. The relationship between Jack and Ruth was both tender and stunning. She was his eyes and ears, but he contributed a richness to her life as well. Neither was young when they met, and the development of their intimacy and trust was not cheaply won. Thinking it cold, and pass unconscious of your need. How did one communicate with this great man? He could, of course, speak, though one had to bend towards him and listen carefully to catch his words. Then came the practice of speaking on his hand, tracing capital letters and spelling out each word until he grasped what one was trying to say. This unusual way of communication slowed conversation down to an extent, but it was intensely moving. I remember my first experience of communicating with Jack in this way, when I realised that here was an entirely different method of human interaction. 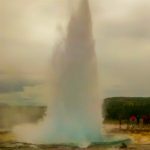 It reminded me of the first time I encountered geysers and bubbling mud in New Zealand, when it dawned on me that I’d never see the ground beneath my feet in quite the same way again. His poetry, like Jack himself, is not always easy, and can be fierce and uncompromising. Given the dark Calvinism that coloured much of his life, he was unlikely to enjoy very wide popularity; but he was, and remains, one of the most interesting and talented writers of the 20thC. He wrote prolifically and continued to submit poems to me to consider for inclusion in Christian right up until his death in 1994 – and even after that, his widow, Ruth, sent me a number of poems that had not previously been published. In Jack’s late poems the anger and brutality of his earlier work has softened and there is a new gentleness and joy that reflects the changes in his personal life. 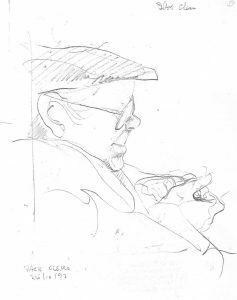 As well as his numerous poetry collections, Jack Clemo published two novels, two volumes of autobiography and a statement of faith. 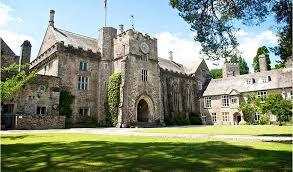 He was awarded a Civil List pension in 1961, an honorary D Litt from Exeter University in 1981, and he was crowned Prydyth an Pry (Poet of clay) at Cornish Gorsedd in September 1970. My friendship with Jack left a deep impression on me, which was one of the reasons why I noticed a poetry competition in his name when it was advertised early this year. The specified theme was ‘wonderful things are about to happen – wildest things are about to happen’. In my poetry file there was a poem, Transition, that I’d written when I was Poet in Residence for the Winchester Ten Days Arts Festival (see blog November 5th 2013), which seemed appropriate, so I sent that in. Just before I left Romania (see blog 18th May 2016) I received an email from the Arts Centre Group to tell me that I was one of three prizewinners in the Clemo competition, and inviting me to attend the prizegiving in May. When I turned up at this event in London, I still had no idea which prize I’d won but, as in the Oscars, we progressed from third prize to second to first. 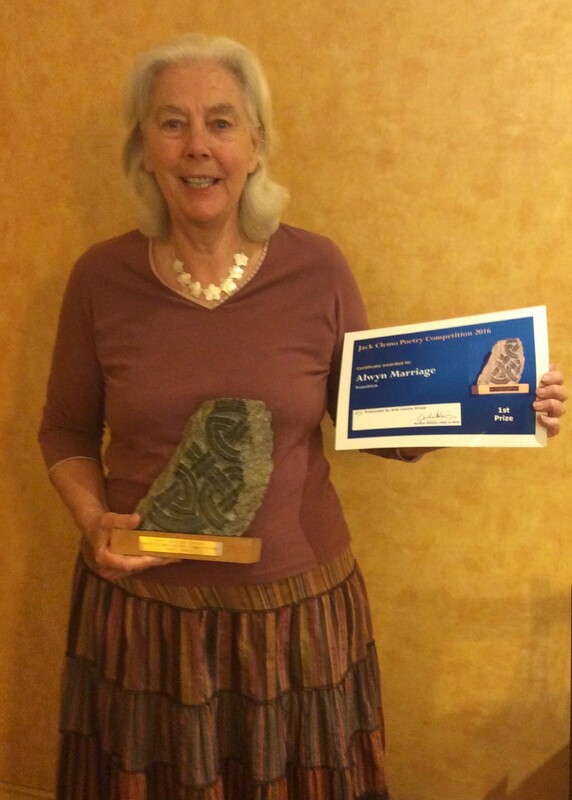 I was thrilled to be awarded first prize, and I know that Jack would have been delighted too. Several people have asked for copies of the poem that won, so here it is? Two novels: Wilding Graft (which won an Atlantic Award in Literature from Birmingham University in 1948), and The Shadowed Bed, which was written soon afterwards, but not published until 1986. Two volumes of autobiography: Confession of a Rebel (1949) and Marriage of a Rebel (1980); and his statement of faith, The Invading Gospel (1958). 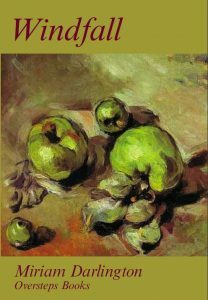 His books of poetry were: The Clay Verge (1951), and The Wintry Priesthood (1951, which won an Arts Council Festival of Britain poetry prize). Both of these collections came together in The Map of Clay. Then, in later life, the poetry collections came thick and fast: Cactus on Carmel (1967), The Echoing Tip (1971), Broad Autumn (1975), A Different Drummer (1986), Approach to Murano (1993, after visiting Italy) and The Cured Arno (1995 – completed shortly before his death in July 1994.